The Oregon Child Support law provides for the enforcement and application of the child support program in Oregon. 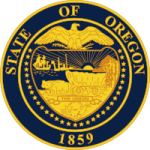 Oregon Revised statutes Chapter 25 sets forth the enforcement mechanisms that the Division of Child Support has the authority to use to recover child support payments including tax refund intercept and wage garnishment. In addition, Oregon Revised Statute Chapter 416 sets forth the expectation that both parents are financially responsible to support their children and the requirement that support orders be based on that assumption taking into account child custody and the income of both parents.